This aircraft makes the predator drone look like my Tonka trucks when I was a kid. And according to National Review Online, not only does it travel at Mach 6, but unlike it's predecessor the SR-71, this one "is an armed platform that will be capable of attacking from the edge of space." A hypersonic plane does not have to be an expensive, distant possibility. In fact, an SR-72 could be operational by 2030. 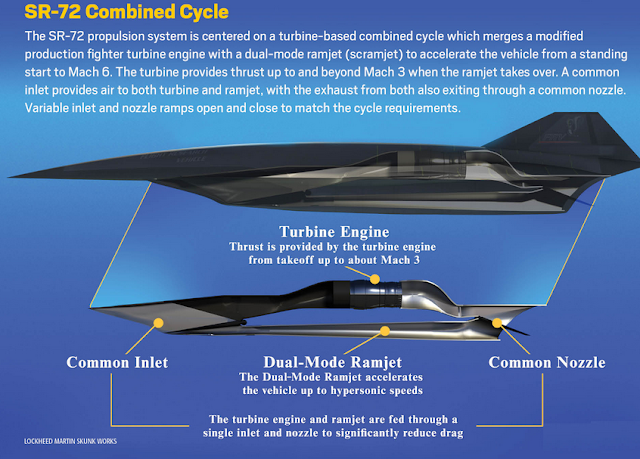 For the past several years, Lockheed Martin Skunk Works® has been working with Aerojet Rocketdyne to develop a method to integrate an off-the-shelf turbine with a supersonic combustion ramjet air breathing jet engine to power the aircraft from standstill to Mach 6. The result is the SR-72 that Aviation Week has dubbed “son of Blackbird,” and integrated engine and airframe that is optimized at the system level for high performance and affordability." Defense contractor Lockheed Martin has unveiled a new spy plane. The SR-72 can fly at the hypersonic speed of six times the speed of sound. It is the successor to the SR-71 Blackbird, which could only fly at the supersonic speed of three times the speed of sound.